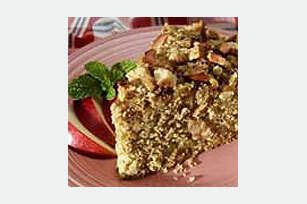 Chopped apples and spicy cinnamon help make this easy-to-make coffee cake a special breakfast treat. Preheat oven to 350°F. Beat brown sugar and oil with electric mixer on medium speed until well blended. Add flour, cereal, baking powder, cinnamon, salt, eggs and milk; beat on medium speed 1 min. Stir in apples. Spread batter in greased 9-inch round cake pan; sprinkle evenly with Crumb Topping. The following apple varieties are suitable for baking-Granny Smith, Winesap, Cortland and Jonathan.